Palak-Nadir is very popular in Kashmiri pandits. 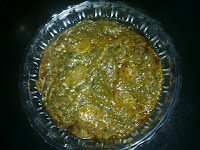 You will find this dish on marriages, functions and in homes on daily routine. 300 g nadir (lotus stem). 2 table spoon mirchi powder (red chilly powder). 2 table spoon saunf (fennel powder). 1/2 tea spoon kala zeera (black cumin). Peel off nadru, cut them into small pieces and wash both palak and nadru. Heat oil in a cooker, fry nadru and keep them aside. Now put zeera, paalak along with hing, salt and fry till water evaporates. Put mirchi and stir till oil separates and dark red colour appears. Add one glass of water and mix saunf and saunth in it. Cover it with a lid and pressure cook for 5 minutes. Lift the lid, mesh paalak with a ladle and add fried nadru in it. Put kaala zeera and cook for another 5 minutes on low flame with constant stirring. Serve with boiled rice or chapatti. note It is advised to prefer paalak of higher altitudes (pahadi paalak) if available because it is good in taste with refreshing flavour. Now-a-days (i.e. in winters) this type is available easily in market. Hi Anjali, You are doing an amazing job.. Can I learn to make 'vaer' from you (rice pudding we make during marriage ceremonies)..
Nitya Ji, thank you for commenting on my blog. I will post the recipe of vaer as soon as possible.